Way back in 1850, Allan Pinkerton started the very first private detective agency: the Pinkerton National Detective Agency. Their agents were simply known as “Pinkertons”. The Pinkertons were highly regarded as both detectives and bodyguards. This brings me to The Pinkertons, a delightfully humorous western mystery series from Canada. That’s right >>> this is a Canadian import depicting life in Kansas City during the 1860s-1870s. 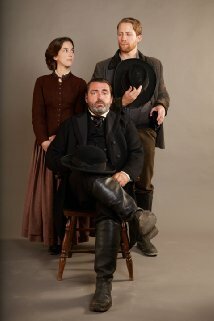 Mrs. Warne (Kate), played beautifully by Martha MacIsaac, is a Pinkerton based in Kansas City. She’s smart and dedicated, a no-nonsense type of Pinkerton. When she receives a new case, she doesn’t stop until she solves it. She is highly respected by Allan Pinkerton (Angus Macfadyen). This of course should be a great news, however because she’s such a good Pinkerton agent, she is saddled with Allan Pinkerton’s son, William (portrayed with great glee by Jacob Blair) as her partner. The beginning of their pairing-up shows us just how much training William needs. While Kate’s methodology includes evaluating the mystery and coming up with a plan of action, William’s approach is sort of play-it-as-it-goes. Although William interjects the humor into the show, surprisingly, he is quite good at solving crimes. Let’s face it, Allan Pinkerton is his father! The show is set a few years after the Civil War so a lot of plots include Confederate vs. Yankee plot lines. It’s interesting that the plots of the shows are based on real Pinkerton files from back then. My husband & I have been watching The Pinkertons series on television as it airs. We both think it’s a lot of fun to watch. I recommend the show but should warn some of you that every once in a while you may notice an “about” being pronounced as “aboot” – which doesn’t bother us in the least. A good mystery show is well worth that, eh? Also, if you would like to see a whole lot of other Cozy Mystery television and movie ideas, click on this link to go to my TV and Movie page. I have written quite a few entries about mystery themed shows and mysteries, as well as some Cozy non mystery themed shows/movies. I too am enjoying the Pinkertons. In my area I can watch them on Saturday or Sunday afternoon. Kathy, I think my husband and I have three more shows to watch before we catch up to the current showings, but we continue to enjoy the show. I hope they are making a second season. I do hope this comes to the UK! It sounds like something I would really enjoy. Rachel, it’s a fun show. The interaction between the two main characters is pretty cute. And, there is no hint of a love connection, which is rather unique to shows with a man and woman in the lead roles. CuppaCozy, I have included a roster at the bottom of this entry so that people can check to see their channels. Danna and Company: Did anyone know that Allan Pinkerton was alleged to have had an affair with Rose O’neal Greenhow, the famous Confederate Female spy headquartered in Washington, D,C, and was held responsible for both Bull Run defeats of the Federal troops. Until Pinkerton found her and brought her to justice, he was supposed to have aided in her escape but I’m not sure I’m a believer in those theories. Pinkerton was credited with saving Abraham LIncoln’s life when he was brought in to Washington, D.C.just before taking office. A. Lincoln to serve as a hostage for the release of southern prisoners of war. Pinkerton also advised the President to stay home the night he was shot. Sorry, Danna and readers. I mean’t that Greenhow was responsible for the Union troop losses at the two Bull Run battles. Not Pinkerton. The dog jumped into my lap and diverted my attention (as dogs are wont to do). Rob, I knew the Pinkertons played a big role with Lincoln, but I didn’t know about any of his affairs. I’m glad you told us about that, but certainly understand your puppy wanting a little extra attention! Thanks for the heads up! It sounds exactly like something I would enjoy….already set it to record. Janie, we have seen all of the episodes sequentially, but I think you might enjoy it coming in now. I certainly hope so! thanks so much for letting me know about this. I have it scheduled. Joyce R, I’m glad you’ve already scheduled it. I hope they replay the series from the beginning when they finish up this season. Rats … the TV station they listed for my area actually broadcasts from a city four hours away. Marja, I’m sorry about that. I hope you are able to find it! I was wondering what TV channels you were watching this show on. Sounds interesting. Rebecca T, at the bottom of the entry I have a link that will show you all of the channels on which you can find the show. I’m binge watching every episode I can find online! I’m hooked and can’t get enough of this show!! Kitty, I’m glad you found The Pinkertons television show. I think Kate and William are perfect, and the mysteries are good, too! I enjoy the series very much. It airs on ABC. Zanilou, this is another series that I hope is continued! This has apparently just started here in the UK, although sadly was not mentioned as one of the new series. I was really annoyed as most of the new stuff I can take or leave but I really wanted to see this and I have missed the first episode. Anybody who can tell me what happens will be much appreciated. Currently watching Pinkerton on Netflix. Enjoy a good clean show,with humor in it, small amt. Of cussing, not the vulgar type! Hope we can get season 2 when we finish watching this one. Pat, it’s good to hear that this show has made it to Netflix, and I certainly hope there is a second season as well! Unfortunately I don’t think a second season has been announced.